The Simplon frame is beautiful in its simplicity. 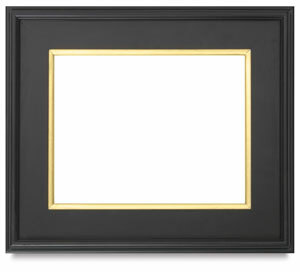 It's a perfect complement to oil paintings, prints, watercolors, photos or mirrors, in finishes to fit all your needs. The accented liner enhances the artwork placed inside. The frame width is 3-1/4" and features a 5/16" rabbet. These beautiful, wood plein air frames in golds and silvers are hand-finished with the "Old World" technique of showing hand leafing lines between each individual leaf that reveals a thin black separation line.